Can I schedule my blog post to appear at a specific date and time? Yes, you can define the publication date and time of a blog post. 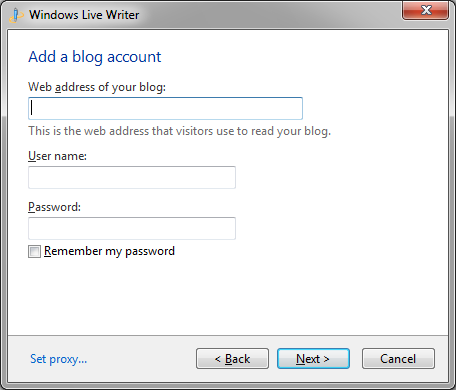 It is very easy to do right in Windows Live Writer. Compose your post, proofread it as usual, set the category and tags, just as you would normally. But before you click the Publish button, find the publication schedule box towards the right, just above the post entry pane. Click on the down arrow or the little calendar icon. 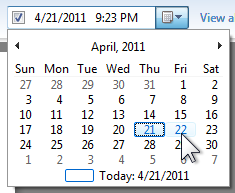 A calendar is shown on the drop-down menu. You can step through the months with the right and left arrows. Just click on the date on which the post is to be published. There is more, of course. You can also specify the exact time of publication. Click on the hour or minute. The current value will be highlighted, selected, just as in normal text editing. Type in the new time. 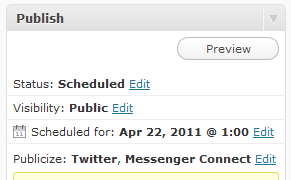 For AM or PM just click on the present setting and use the up or down arrow key to change from morning to afternoon. Then go ahead and click the Publish button on the Home tab of the Ribbon. The post is uploaded to your blog but publication is held. Can you change your mind about the publication date and time? Sure. If yours is a WordPress blog, sign in to your Dashboard. Click the Posts tab on the left and again in the the expanded menu. To change the publication date or time, click the Edit option underneath your post title, move the pointer over that area to see the options. 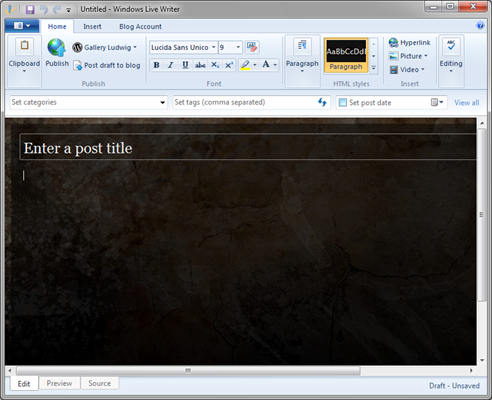 On the right side the Publish panel displays the status and provides edit options. Here you can change the various parameters including date and time of publication. Note that the WordPress time uses the 24-hour clock format. The time zone is specified in General Settings. For other blogging services the procedure is similar. 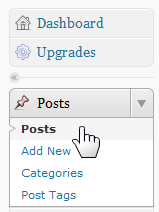 For example for Blogger, click Edit Posts on your Dashboard. Click Edit in front of the post of interest. 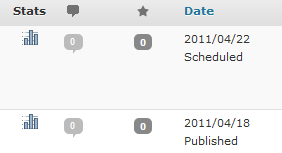 Click Post Options at the bottom of the edit window and you can set or change the publication date and time. Now all you have to do is to get all your posts ready and scheduled and you can be off to your vacation, knowing that your blogging service will publish your posts on schedule and keep your audience happy and informed. Where are the thumbnails stored for a post with a SkyDrive album? 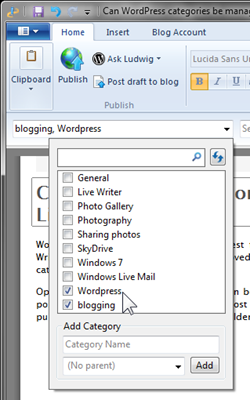 Windows Live Writer has an insert option for adding a SkyDrive album to a post. 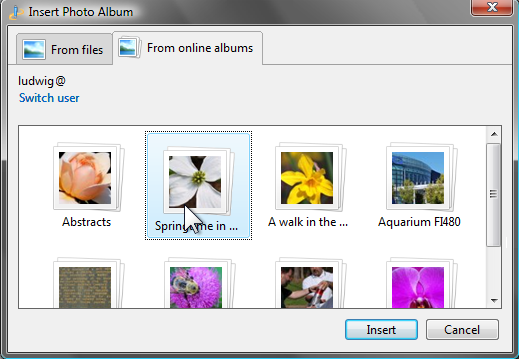 When Add online album is selected, an “Insert Photo Album” dialog opens. It may ask for a sign in before showing all the albums on your SkyDrive. Click an album icon and then click Insert to get the process started. Live Writer downloads the pictures from the album in order to create the graphics. 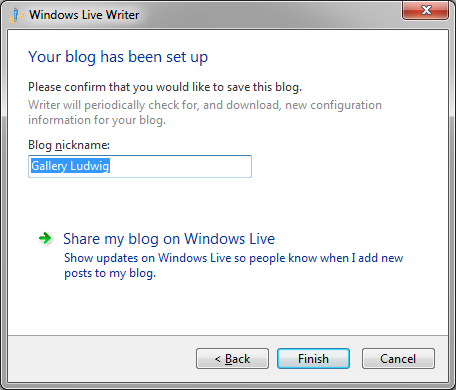 An example of a SkyDrive album is shown at the end of this post. Live Writer creates a folder for the downloaded images and newly created thumbnails on your boot drive under Users\yourname\AppData\Local\Temp\WindowsLiveWriter-xxxx. The album will be shown by a collection of thumbnails, the album title, and a couple of hyperlinks. A new “Photo Album Tools” Ribbon tab is available whenever the album art is selected. The most useful and interesting tools are in the Album styles section of the tab: A half dozen layout styles are shown. The first, default, layout, shows the thumbnails the same way as pictures are shown in a photo email. Two other layouts show the pictures in a flat arrangement, the remaining three show randomly oriented little pictures. The thumbnails can be rearranged with the “Shuffle photos” tool. Just click on this command and observe the new arrangement. Continue until you are happy with the presentation. 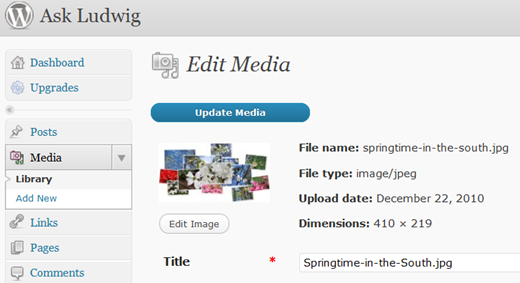 When the post is published to your blog, the created display pictures are uploaded to the blog image store. In this case, this being a WordPress.com blog, the images wind up online in the blog’s Media Library. If one of the random display options is selected this will be one image of the entire arrangement. For the other three layouts, Squares, Grid right, and Grid left, the individual thumbnails are uploaded to the blog media library. 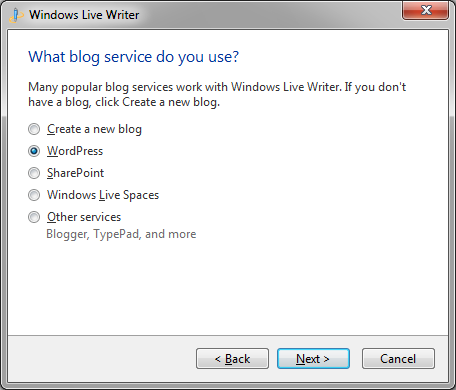 As you would expect, Windows Live Writer does a fine job of cleaning up after itself. In the case of this post, the temporary store contained over 3 GB of material. Once the post has been published this folder is emptied and removed. Now, aren’t you glad you asked? 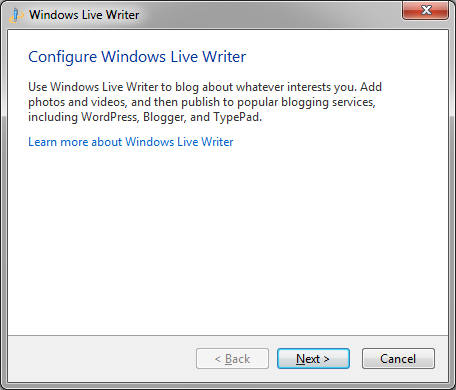 This allowed me to tell you a little about how Windows Live Writer offers another really nice feature and does a great job of managing it. Here at last is the demo album. Enjoy!